The last sounds we heard on Mount Isarog in 1988 were birds singing, cicadas buzzing, and chain saws roaring. As the Philippines sought to redefine itself after the 1986 revolution that deposed Ferdinand Marcos, conditions in the countryside could barely have looked worse. Armed conflict between several rebellious groups and the army were common, the economy was in tatters, poverty was increasing dramatically, government was in disarray (with coups attempted several times each year), and local "warlords" often operated with impunity. On Mount Isarog, the national park seemed to be viewed as a no-man's land, open to anyone willing to exploit it. But when Marcos was deposed, people gradually became aware that they could speak up and influence local events with much less fear of violent reprisal. Newspapers began to publish more detailed and critical analyses of local events, identifying corruption and mismanagement in government and business. International aid agencies that had virtually abandoned the Philippines because of the corruption and repression of the government returned quickly, and began to help the Filipino people turn things around. In 1990, several international agencies worked together with the Philippine government to arrange a "debt-for-nature swap," in which old unpaid loans to the Philippine government from foreign banks were paid by the international agencies at a discounted rate, in return for a promise to spend a portion of the value of the loan (in this case, several million dollars) on revitalizing the national park system. A small part of this funding went to the Haribon Foundation, one of the very few conservation groups that had remained active and vocal during the Marcos years. With this funding, Haribon initiated a small program in 1990 in the communities surrounding Mount Isarog to help the poor farmers in the area—thousands of whom lived within the boundaries of the park—develop a basic understanding of forest ecology, environmental economics, and park management. It also provided the tools to help translate the conceptual issues into practical action: Local people were given paralegal training, taught how to run community meetings, and taught how to write proposals for further funding. It also taught people about the new national constitution, which delegated much authority for resource management to local communities. The results of the program were apparent by 1992. A proposal from the community to a Finnish funding source resulted in a grant to reforest many of the areas of sawgrass on the mountain slopes that had nce been rain forest. The reforestation would provide fuel wood to lessen impact on the remaining rain forest, would help control erosion and flooding, and would eventually provide a source of building materials. A grant from the Foundation for the Philippine Environment established an "alternative livelihoods project" that allowed former loggers and slash-and-burn farmers to switch to less destructive means of living. Intensive vegetable farming, livestock raising, and small crafts flourished as a result. The community, without outside funding, also established a group of forest guards to control illegal logging in the rain forest; the members would usually simply talk with the loggers, and convince them to stop, although they were also deputized by the Department of Environment and Natural Resources to confiscate chain saws and any other materials used in illegal logging. Because most of the remaining loggers were coming from outside the local communities, the communities passed ordinances against transporting lumber on the community roads as another legal means to stop the deforestation of the park. 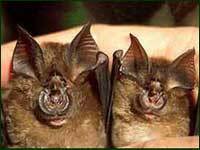 Two simiar species of Rhinolophus captured in 2001 in Kalinga Province, northern Luzon.